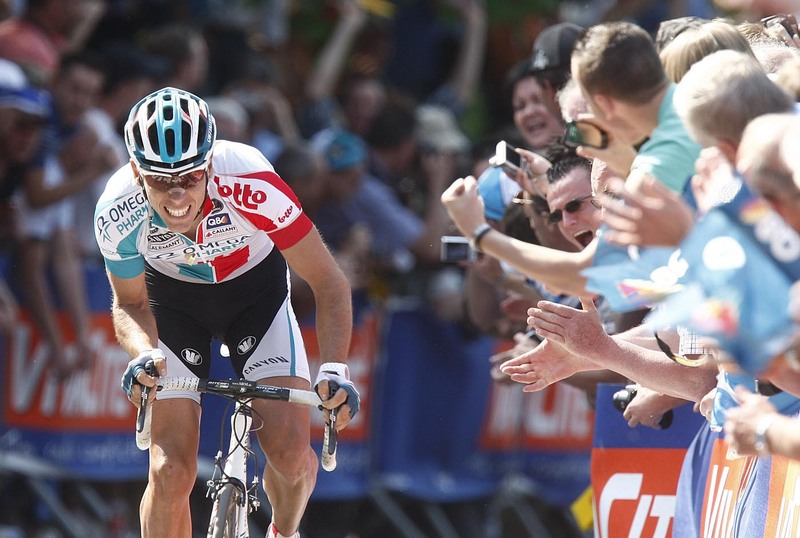 the second round of the 2012 Ardennes Classics – is likely to surprise. The usual names, including last year’s winner Philippe Gilbert, are off-target. Gilbert will be without his BMC Racing team-mate, Cadel Evans. Tour de France champion and 2010 winner, Evans announced on Monday that he’ll skip Fleche and Liege-Bastogne-Liege. The weather forecast is ugly: high of 11°C, cloudy and chance of showers. Team BMC Racing said that Evans continues to recover from a sinus infection, which saw him abandon the Amstel Gold Race on Sunday. The lack of an all-out favourite will add even more suspense at the start line outside Charleroi’s football stadium. The riders face 194 kilometres and 10 climbs to the finish in Huy, including three climbs up the city’s wall, the Mur de Huy. After a likely escape on the large loop to the south, the race will climax with three climbs: the Côte d’Amay, the Côte de Villers-le-Bouillet and the final ramp in Huy. Expect to see Gilbert, Damiano Cunego and Jelle Vanendert. The men’s race is preceded by La Fleche Wallonne Femmes, part of the UCI Women’s World Cup. Nicole Cooke, Sharon Laws, Katie Colclough and 2010 winner Emma Pooley are among the British riders in attendance. Cooke won the race in 2003, 2005 and 2006. Marianne Vos is the defending champion. Purito placed second in the last two years. He is eager to take the top step, however, his Amstel result, 24th, doesn’t indicate much. The Belgian champ seems to be coming on form as he’s moving up gradually into the rankings. He placed sixth on Sunday, his best result yet. The Amstel-Fleche double? The Italian will have confidence from his win, but will likely make way for another surprise winner. He’s a long shot, but may surprise. Schleck would need to attack ahead of the Huy and hold off the punchy riders, like Rodriguez.